I live in Baltimore, Maryland! That sentence has been in the works a long time. Last Friday, my parents helped transport most of my stuff to a Canton apartment that I will be sharing with Kevin, one of Annie’s coworkers. We arrived a little later than planned, but the move went off without any major complications. As a housewarming gift, some woman backed her SUV into my car and scratched the hood and bumper and broke one of my fog lights. I then met one of Baltimore’s finest, who was able to locate the SUV owner’s boyfriend who told us this woman “didn’t know she hit anything.” That probably explains why she left her vehicle parked in front of my car where my white paint on her gray SUV was clearly visible. Did I mention that parking by my new place is not one of the selling points for the area? It’s not. I’m not completely settled in my new apartment so it doesn’t feel like home just yet, but I will post photos next week once everything is the way I’d like it. I’m going to my house in Pennsylvania this weekend, so it’s strange that when I leave for Baltimore again on Sunday, I’ll actually be going home—to my new home in Baltimore. 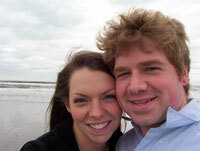 Annie and I drove to the New Jersey shore on Saturday to do something different for our five-year Anniversary! It’s hard to believe that we started dating five years ago, but at the same time I can remember so many things from the earliest days, weeks, months, years that made the five years seem short. This trip was the first time that we went to the beach together and it turned out to be a great day. As it was such a momentous occasion, I felt the urge to bring the camera and take more pictures than has been the case of late. We took a short scenic detour through Camden on the way to Ocean City where we started our day on the boardwalk. It was overcast and cold (for the beach), but that didn’t stop us from taking our shoes off and walking by the water. After about two hours there and getting lost in Ocean City, we picked up a Cape May County map and drove to the Cape May Courthouse Diner for a delicious lunch. By this time, the temperature was in the 70s and the sky was a bright blue. After walking around the city and beaches of Cape May for a few hours, we drove to Cape May Point to end the day at Sunset Beach. We sat on some rocks near the water and shifted through the pebbles that make up the beach to find Cape May Diamonds and other interesting rocks to remember the trip. It was a wonderful trip—without an itinerary to constrain or stress us at any point—and the most relaxing day I’ve had in a very long time.